Mahinda was the son of Emperor Ashoka. He became a monk at the age of 20 with Moggaliputta-Tissa as his preceptor. Mahinda together with four other monks were sent to Sri Lanka to spread Buddhism. 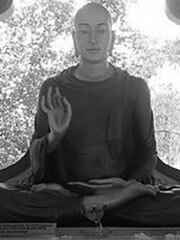 They preached the teachings of the Buddha to King Devanampiyatissa (247 BC-207 BC), who then become the first Sri Lankan monarch to become a Buddhist. Mahinda brought with him the Pāli Canon. Ashoka expected Mahinda to succeed the throne and tried to convince Mahinda to withdraw himself from Monkhood and to resume his duty as a prince. But the reluctant prince was persistent toward his progress on spiritual path. At the same time the Hindu community of the state at large opposed to accept Mahinda the monk as their prince. Ashoka failed to convince his son and allowed him to continue as a monk.